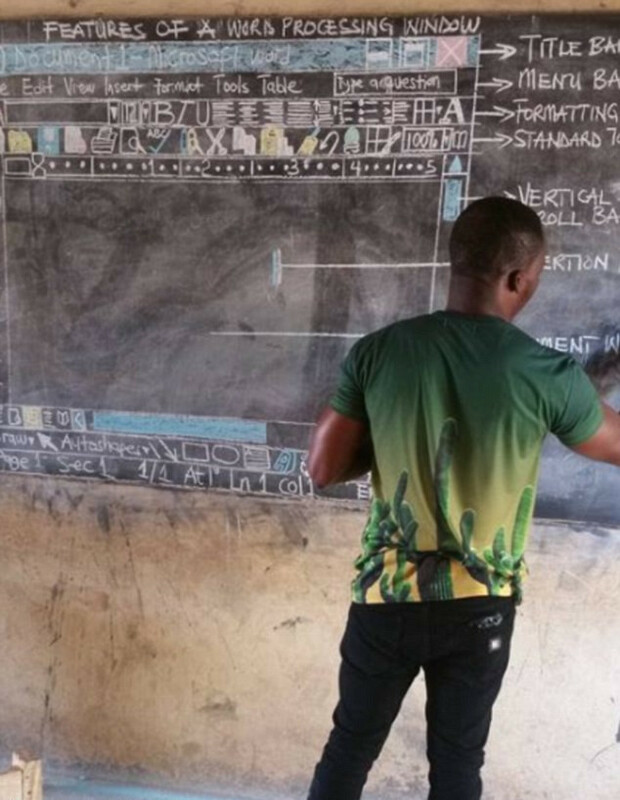 The world is praising a teacher from Ghana who is actually using colored chalk and a simple blackboard to teach his students how to use Microsoft Word. The teacher is showing his middle-school students how to use computers—without a computer. 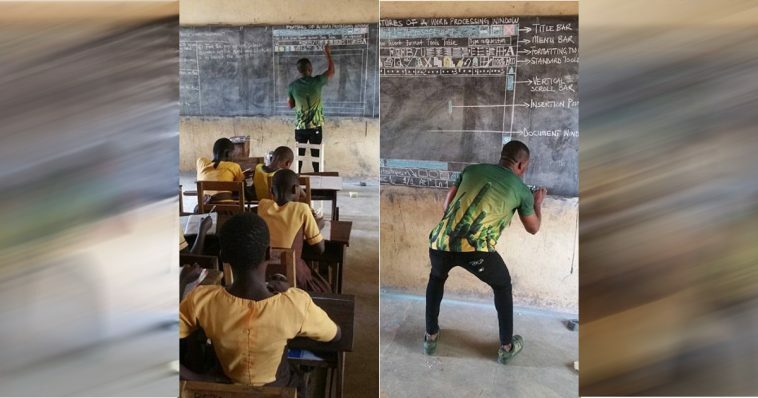 The resourceful teacher’s name is Richard Appiah Akoto, and he is 33 years old. Using his chalk, he draws versions of a computer screen onto a blackboard. In mid-February, he decided to demonstrate his technique and teaching methods using a Facebook post. Students can even be seen copying Richard’s drawings into their notebooks. The school at which Richard teaches—Betenase M/A Junior High School—is located in the town of Sekyedomase, which is a roughly two and half hour drive north of Kumasi, Ghana. Kumasi is the second largest city in Ghana. Richard is an information and communication technology teacher. Even though his students—who are 14 and 15—are expected to pass a national exam that includes ICT as a subject, the school does not have any computers. Actually, it has not had any computers since 2011. If the students don’t pass the aforementioned exam, they are not allowed to go on and study in high school. 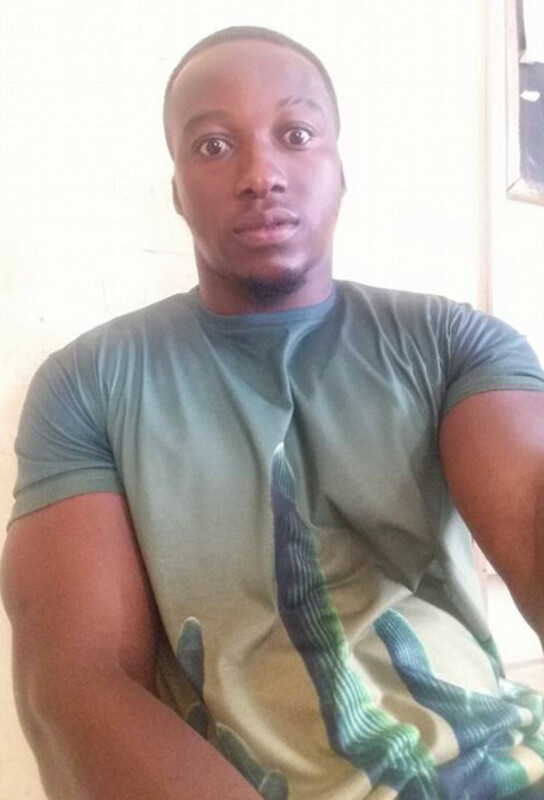 Richard — or Owura Kwadwo—described the teaching of ICT in Ghana’s schools “funny” in the Facebook post he made. He said he loves his students, so he will do what must be done so that they can understand what he is teaching. He didn’t expect the post to go viral. He said he merely enjoys posting photos on Facebook, so he felt like sharing the pictures. Richard said the pictures weren’t the first time he drew a computer screen—he does it all of the time in the classroom. 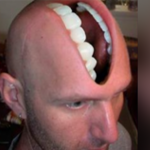 After the post went viral and images were shared thousands of times, The ICT teacher was contacted by Microsoft. The company made a promise to send Richard new computer equipment as well as give him access to the company’s ‘professional development resources’. Microsoft was made aware of the story largely because of an entrepreneur named Rebecca Enonchong. The entrepreneur contacted the software giant via Twitter, pointing out that Richard was teaching kids how to use their product without actually having access to it. 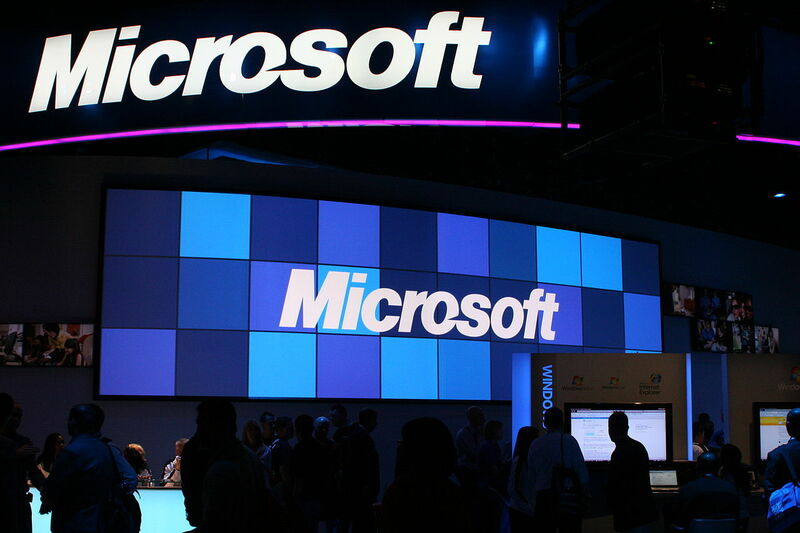 Enonchong suggested Microsoft get the teacher “proper resources”; last Tuesday, Microsoft responded. The news organization Quartz Africa pointed out that Richard’s situation is typical of a “dysfunctional” and “under-resourced” public school system, adding that many economically disadvantaged families in Ghana and throughout Africa are being forced to send their children to private schools because the free public primary schools are lacking in resources. There have been calls in Ghana for resources that will help rural schools, like the one at which Richard teaches. Those schools are struggling as a result of “teaching logistic challenges”. At the moment, we’re not sure how many computers will be sent to Richard’s school; however, he says that he needs roughly 50 in order to properly teach his students. Richard does have a personal laptop, but doesn’t use it in the classroom because the device’s features differ from what he is supposed to be teaching his students. He’s supposed to teach his students with a desktop as a reference—according to the official syllabus. The exam that the students have to pass depends on their ability to remember the information from the syllabus, and that has not been updated since it was introduced. Richard says that only one of his students actually managed to get an “A” last year. Richard added that people in Accra, which is the capital of Ghana, will certainly pass the ICT portion of the exam because they have regular access to computers and know what they are doing with a mouse. Many of his students, sadly, do not know what a computer mouse feels like. Ghana, a constitutional democracy, is considered a “middle income” country; its economic prosperity is believed to be growing. It actually has one of the highest school enrollment rates in Africa, and the literacy rate is over 80 percent. However, if an ICT teacher needs to draw computer screens on a blackboard using colored chalk, there’s clearly a ways to go.